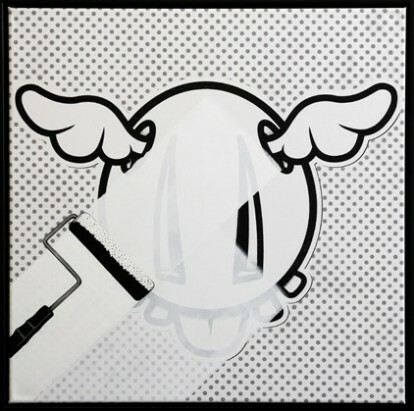 D*Face’s current exhibition presents his latest body of work, which reflectsupon times of chaos, disorder and loss, as informed by shifting circumstances in the social climate. Exploring topical and long standing dystopian sentiments, New World Disorder confronts the effects of love and loss from a physical, mental and cultural standpoint, drawing up on the artist’s direct experiences. Elements of the show are inspired by The Tillman Story,the 2010 documentary film about the 2004 death of U.S. Army Ranger Pat Tillman in the war in Afghanistan, the cover-up of the true circumstances of his death, and his family’s struggle to unearth the truth. 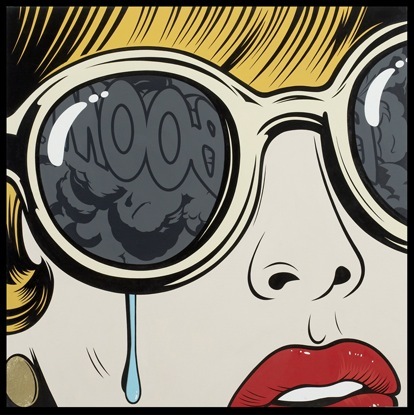 D*Face explains the ideas behind his work; “My work reflects our popular culture encompassing the American dream and the ideal of good triumphing over evil, no longer relevant in today’s society where the ‘invade now and ask questions later’ philosophy isn’t tolerated or indeed wanted. Colliding cultures are no longer receptive to the American way, the Superhero’s triumph of good over evil as portrayed through the political circus is now decoded through the eyes of differentcultures,weary and wary of the sub-plot played in today’s political climate where warequals brand invasion”.